The October 2014 State of Oregon Economic Indicators is now available here. Special thanks to KeyBank for their generous support of this project. The Oregon Measure of Economic Activity rose sharply in October on the back of positive contributions from all sectors. The three-month moving average, which smooths month-to-month volatility in the measure, rose in tandem with the monthly number to 0.37. Employment data was stronger almost across the board, with only the natural resources and mining sector making a negative contribution to the index. The manufacturing employment contribution was particularly strong, suggesting that Oregon is seeing growth in the sector consistent with what national indicators suggest. The household sector was bolster by solid contributions from initial unemployment claims, employment services hiring, and labor force gains. These factors suggest that the Oregon labor market will continue to add jobs at a solid pace in the months ahead. 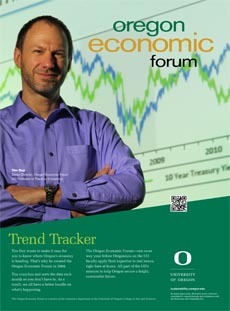 The University of Oregon Index of Economic Indicators gained 0.2% in October. The level of initial unemployment claims fell while employment services payrolls (mostly temporary help firms) gained sharply. This indicates that not only are firms laying off workers at a very low rate, but hiring activity may be accelerating further. The two indicators suggest continued growth in Oregon at an above average pace of activity. Further gains are likely as the national economy will continue its general upward trajectory for the foreseeable future. Note that it is not uncommon for the UO Index to track sideways during a mature expansion.